The Mayor Elect Councillor Les Sibley has chosen a cultural theme for one of his first fundraising events of the forthcoming Mayoral Year. Bicester Arts Club and Bicester Sculpture Group will present over 120 works of art by 30 local artists including, oil and watercolour painting and sculpture in a range of mediums over the weekend of May 12th to 14th. The event coincides with Bicester’s Healthy Town initiative and Art Weeks as well as marking the 30th Anniversary of Bicester Arts Club. Established Bicester Watercolourist David Meeks will be painting during the exhibition. Bicester Village are proud sponsors of the Art collaboration which takes place in Bicester’s John Paul II Centre and is free to the public on Saturday and Sunday opening from 10 till 4pm. 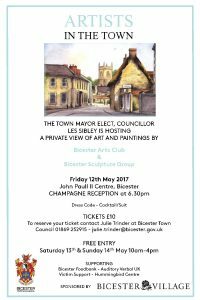 Tickets are also available from Bicester Town Council for a special private view reception on Friday the evening of 12th May with proceeds going to the Mayors Charities (tickets are £10 and can be purchased from the Council Offices at Garth Park). The Mayor Elect’s charities for 2017/18 are Bicester Foodbank, Auditory Verbal UK, Victim Support and the Hummingbird Centre. To launch the “Paint the Town” exhibition – young people are invited to enter a competition to produce a drawing or painting in any medium of the Town. Pictures should be received at the Council offices by Wednesday 10th May and the best entries will be on display at the exhibition throughout the weekend. You can now book your stall for this year’s Bicester Carnival in association with Armed Forces Day! All you need to do is complete the application form and risk assessment below and get them into us at the Council Offices in Garth Park by Friday 19 May 2017. The annual charity fun walk is back this Easter Saturday with a gentle jaunt of approximately 3 miles planned to leave Garth Park at 11am. The route is dog friendly and we look forward to seeing you there. For information on how to sign up or to enter online, click here.